We had a low-key weekend for the box office, with one new release performing right at expectations (though certainly a strong number for a low-budgeted project), and the rest barely being noticeable. 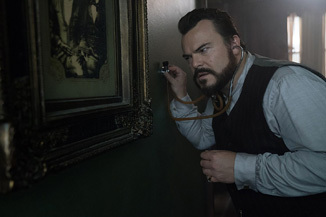 Our winner of the weekend will be the scary kid flick The House With a Clock in Its Walls, the Eli-Roth directed fantasy film starring Jack Black and Cate Blanchett as a couple of magicians trying to stop the end of the world along with a chipper and determined boy. It's a formula for fun and the kind of scares that children of a certain age truly enjoy, reminiscent of movies such as Something Wicked This Way Comes. Anyway, having seen the movie last night, it's a lot of fun and the kids in the office were all in. It earned $7.8 million yesterday, including $840,000 in Thursday night previews. I'd say you're probably looking at about $23 million for the weekend, which is just fine for a movie that had a budget of just at $40 million. It's the kind of movie that could have a good life into October, too, although we do have stuff like Smallfoot and Goosebumps will be coming soon. Then we have Fahrenheit 11/9, the Michael Moore bring out the anti-Trump vote documentary. I mean, at this point, do people really need to hear what Moore has to say about government? Back in 2002, times were different. We didn't have the constant onslaught of Twitter and social media telling us all the things that were going on, and the polarization and division weren't nearly as distinct. Frankly, most of us need a respite from this type of commentary. That was reflected in the $1 million earned yesterday on 1,719 screens. Fahrenheit 11/9 should earn $3 million for the weekend, but it's not going to be anything like the major influence Fahrenheit 9/11 was. It earned $120 million.